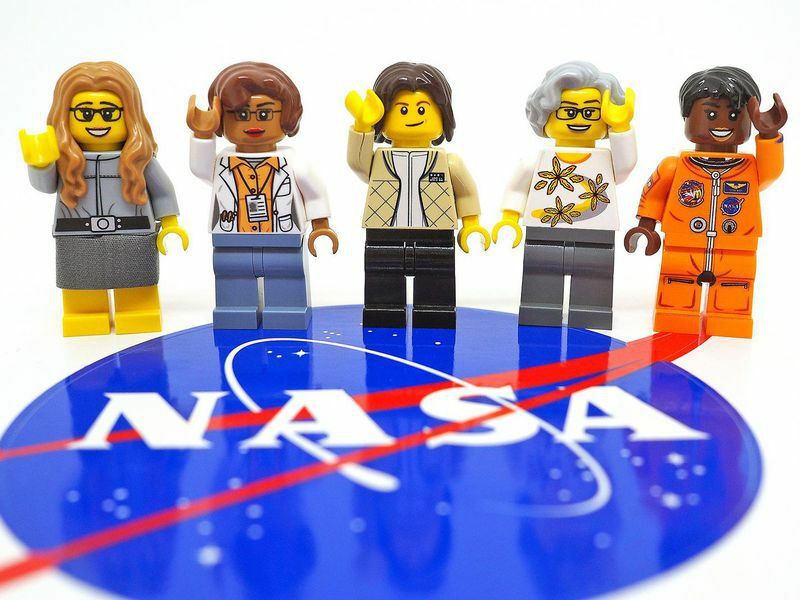 Teacher Resources > Monday Morning Ready > Meet LEGO's "Women of NASA"
Meet LEGO's "Women of NASA"
Name a woman who inspires you. What about this woman do you find to be inspiring? What does she inspire you to do? Have you ever noticed the difference between "boy" and "girl" toys? In what ways do you think the differences you see could affect how you play, the way you think and the career you choose to pursue in the future? According to the article, a 7-year-old named Charlotte wrote to LEGO in 2014 complaining that the company's female figurines were lame. In response, LEGO launched a limited-edition product featuring female scientists. Why do you think that set sold out so quickly? What do you think LEGO and other toy manufacturers should learn from this incident? Do you think more girls would go into STEM careers if the toys they played with as children had more of a STEM focus? Why or why not? As a class, brainstorm a list of women who work in STEM-science, technology, engineering and math-fields. If you wish, have the class conduct research to identify more women to add to the list. Invite students to select one woman from the list. Encourage them to conduct research to learn all about the woman they picked and her career. As students search for information, instruct them to also find photos of the woman at work. Using the photos as inspiration, challenge students to design a LEGO figurine of the woman and her workplace. Invite students to share their figurines and letters with the class. After all presentations are complete, challenge the class to identify ways that the candidates presented could be categorized into groups that could be featured in new LEGO sets. Have students complete the activity in small groups. Instruct each group to select one woman and conduct research to learn about her career. Then have them study the photos they found, brainstorm ideas for a figurine and draw a picture showing their design. Once their designs are complete, give groups time to write letters to LEGO pitching their ideas. Have students complete the activity in small groups. Instruct each group to select one woman and conduct research to learn about her career. Have them study the photos they found and brainstorm ideas for a figurine and the woman's workplace. Encourage them to draw pictures of each. Once their designs are complete, give groups time to write letters to LEGO pitching their ideas. Have students complete the activity in pairs. Instruct partners to select one woman and conduct research to learn about her career. Have them study the photos they found and brainstorm ideas for a figurine, the woman's workplace and any accessories they might want to include. Encourage them to draw pictures of each item in their new LEGO set. Once their designs are complete, give groups time to write letters to LEGO pitching their ideas. Instruct each student to select one woman and conduct research to learn about her career. Have students study the photos they found and brainstorm ideas for a figurine, the woman's workplace and any accessories they might want to include. Encourage them to draw pictures of each item in their new LEGO set. You may also want to provide an assortment of LEGOs and have students build models of their designs. Students can create paper models of any items that are missing. Once their designs are complete, give students time to write letters to LEGO pitching their ideas. Invite students to explore this site developed by the Chandra X-ray Center to learn about women in STEM, both acknowledged and unknown, for their roles in the exploration of the world and universe around us. The site includes biographies, activities, free posters you can download and a list of other resources you can use to teach students more about women in STEM. Use this Smithsonian Learning Lab collection to teach students about women in the aerospace industry, from the early pioneers to those helping pave the way to Mars. The collection, originally created as a “Stem in 30” activity at the National Air and Space Museum, includes lesson plans, teacher resources, videos, articles and photos. From hunting meteorites in Antarctica to exploring the farthest reaches of the universe from remote mountaintops, Smithsonian women scientists are an adventurous group. Introduce students to some of these outstanding women with this site from the Harvard-Smithsonian Centre for Astrophysics. This exhibit from the Smithsonian Institution Archives highlights the careers of five women pioneers in the field of science journalism. Encourage students to read about these women who, through their bylines, conveyed an important message: women could not only understand science but they could explain it well to others. Review this special report from Smithsonian Magazine to learn about a variety of women who currently work in STEM-related fields. The lack of women leaders in STEM creates “a catch-22 death spiral.” Read this Smithsonian article to learn how robotics teams are trying to change that.